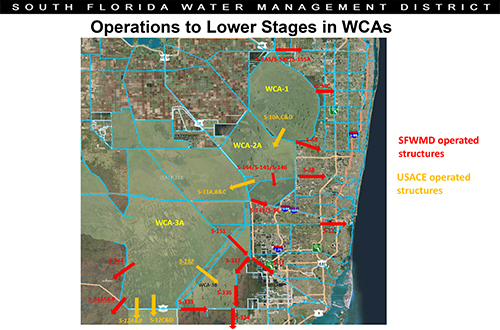 West Palm Beach, FL – The South Florida Water Management District (SFWMD) this week is taking additional actions to lower water levels in the conservation areas to create capacity for sending more Lake Okeechobee water south by utilizing Gov. Rick Scott's state of emergency declaration. The declaration of state of emergency, which follows an emergency order that Gov. Scott directed the Florida Department of Environmental Protection to issue on June 20, will allow SFWMD to expedite the installation of additional temporary pumps. These pumps will increase the capacity of water that can be moved out of Water Conservation Area 3B into Shark River Slough and into Everglades National Park by up to 200 cubic feet per second (cfs). Additionally, numerous other permanent and temporary pumps are currently being operated by the District 24 hours a day to move more water out of the conservation areas. The record rainfall in May caused Lake Okeechobee to rise more than a foot, which led the U.S. Army Corps of Engineers (USACE) to begin releases from the lake on June 1 to the northern estuaries. At the same time, this record rainfall inundated the water conservation areas, causing them to rise above their regulation schedules. To combat this, SFWMD is taking every action within its authority to lower water levels, including storing water on public and private lands, utilizing every available structure and installing temporary pumps to move additional water. The District is also utilizing its communications channels to keep the public apprised of all these actions. Today's video update, presented by SFWMD Hydrology and Hydraulics Bureau Chief Akin Owosina at the Governing Board's monthly business meeting, can be seen by clicking HERE or visiting the SFWMD website dedicated to the high water emergency situation, www.sfwmd.gov/managinghighwater. SFWMD Hydrology and Hydraulics Bureau Chief Akin Owosina briefed the Governing Board on July 12, 2018, about the latest water conditions in South Florida and actions being taken to lower regional water levels.